For those of you who don’t have it in your calendar, you may be unaware that this week is Caribbean food week! 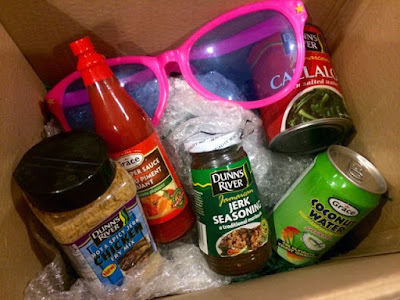 To celebrate, the lovely people over at Grace Foods sent me a hamper of five Caribbean ingredients and challenged me to come up with some tasty and exciting recipes to get you all in the carnival spirit! 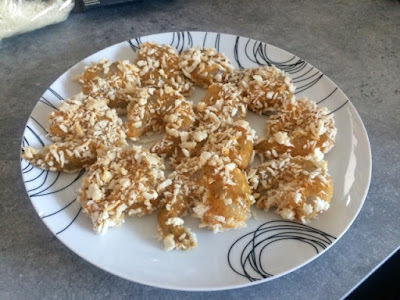 The parcel they sent me was a real mixed bag, quite literally, so I’ve created several different recipes that I will post throughout the week. For my first Caribbean inspired dish I used both the Hot & Spicy Jerk Chicken Fry Mix and the Hot Pepper Sauce. I am by no means an expert on Caribbean food but it’s no secret how much The Boyfriend and I love to cook jerk chicken. 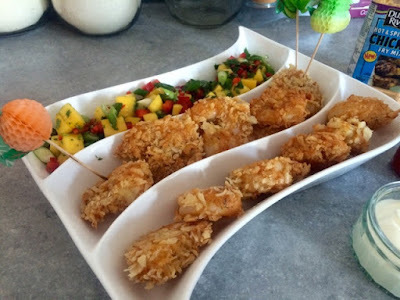 However, as I thought you’d probably all be bored of me going on about just how much I love it, I decided to try and create Caribbean inspired dishes that are not jerk chicken. Let me introduce to you… jerk prawns! 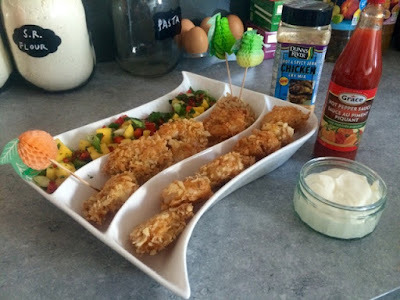 I had two different kinds of jerk seasoning in my goodie bag from Grace Foods so it was definitely a challenge to come up with some good and varied recipes. 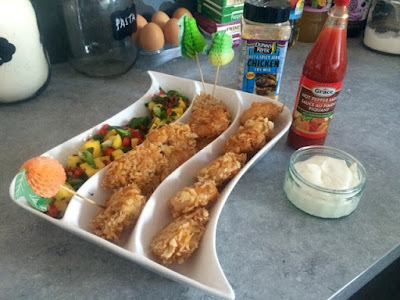 I chose to use the dry mix in this prawn dish as I thought the dry mix would make a great substitute for flour when breading them and at the same time give them a great spicy flavour. This dish works brilliantly as a sharer starter and would serve 2-4 depending on how generous you’re being! I used some really nice big juicy tiger prawns that I took a special trip to the fishmonger at Whole Foods to get but you could substitute them for ordinary sized supermarket king prawns if that’s easier, you just may wish to do slightly more. 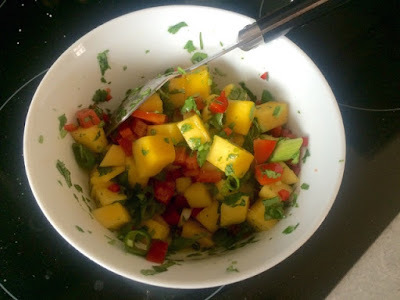 The cool, fruity and zingy mango salsa compliments the mildly spicy flavour of the prawns but for the more adventurous eater I chose to serve the hot pepper sauce as a dip. 1. Chop all the mango salsa ingredients and mix together in a bowl. 2. Set up your breading ‘conveyor belt’. 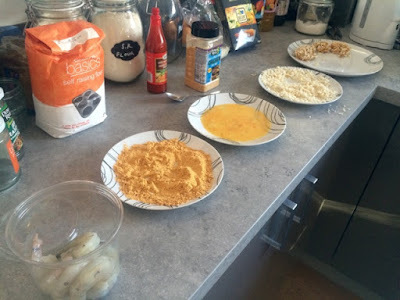 You need the prawns at the beginning, then a plate or shallow dish of the dry jerk mix, beaten egg on the second plate, breadcrumbs on the third plate and finally an empty plate on which to put your ready to cook prawns. Dip the prawns one by one onto each dish along the conveyor belt ensuring they are completely coated at each stage. Always go in the order of dry mix first, then egg, then breadcrumbs. 3. Fill a large frying pan with 1-1.5cm vegetable oil, bring to a high heat. You can test the temperature by dropping in a breadcrumb, it it floats the top and sizzles then your oil is hot enough. Drop the prawns in 3-4 at a time so that they are not crowded in the pan. 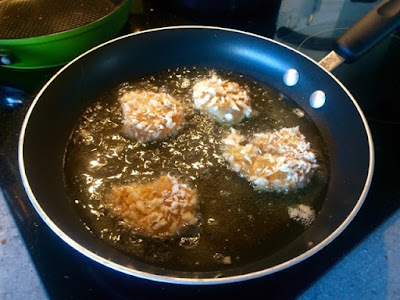 Fry for 1-2 minutes on each side or until the breadcrumbs are nice and golden. 4. Set cooked prawns aside on some kitchen paper to soak up excess oil while you continue frying the rest in batches. 5. Serve up with the mango salsa and yoghurt and hot sauce on the side for dipping. Comedy fruity cocktail sticks are optional.